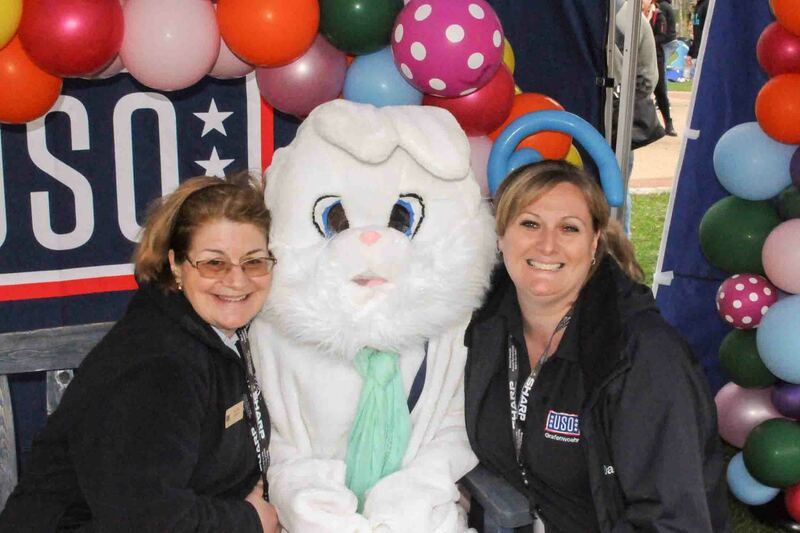 Carolyn Harris and her United Service Organizations staff helps run the Easter Egg Hunt here, which took place April 14 at Wild B.O.A.R. Outdoor Recreation and attracted hundreds of kids and families. Harris and the USO strive to help Soldiers and families connect to home while serving overseas. Time and time again, they deliver on this promise. GRAFENWOEHR, Germany — Carolyn Harris knows the challenges the United Service Organizations, better known as USO, faces as it strives to help Soldiers and families connect to home while serving overseas. Time and time again, she and her staff deliver on this promise. In her position as USO director for all Bavaria, Harris oversees nine full-time employees — including two new hires — and 205 volunteers who logged a total of 10,366 hours in 2016. The staff of USO Bavaria work together to deliver services for 363 programs to Soldiers and their families permanently stationed at Grafenwoehr and Vilseck, as well U.S. Army Europe’s rotational forces in the Grafenwoehr Training Area. The USO offices consist of two facilities, one at Grafenwoehr, which services the Tower and Rose Barracks communities, and one at Camp Aachen serving U.S. Army Garrison Bavaria’s “fifth community” of rotating troops. No brick and mortar facility exists in Vilseck, but the USO’s presence is felt through the programs they operate there. Camp Aachen USO is only for 18 years and older. Both facilities have been renovated with fresh paint and feature a more comfortable gaming room. They also have computers, a children’s area with some toys and, of course, always food. Soldiers and their families can always get a hot dog, soda and volunteer staff with “friendly smiles and caring attitudes,” she added. Kinderfests, Military Spouse Appreciation Day, holiday celebrations, free weekly family dinners and athletic events are a few of USO Bavaria offerings. Most events are family-friendly, but some are tailor specifically to young adults. Harris comes from a military family. She was born in Alabama, and her family moved on orders two weeks later. She moved around while growing up, living in New Mexico, South Dakota, Arizona and Liberia. After graduating from the American Cooperative School in Monrovia, Liberia, Harris continued her education and received a degree in foreign languages from Arizona State University and master’s in business from the Florida Institute of Technology. She is fluent in German, Spanish and French. Harris is an experienced traveler, logging over 500,000 miles in her time with USO. She has a wealth of experience that has helped her in her current position and has a family history of USO involvement. Both her mother and grand-mother volunteered at the organization. Prior to her employment with USO, Carly worked in the hospitality industry, as a Hotel Front Desk manager, as well as a Cruise Manager, and Travel Agent. In addition to several American sponsors, Harris is appreciative of the many sponsors who donate goods and financial support to USO. Even German companies provide support to the facilities and its operations across Europe. The history of the USO is a long one, and the organization has evolved in step with the needs of those they serve. Formed in 1941, the USO was conceived by President Franklin D. Roosevelt. Roosevelt was looking for a way to bring together service organizations to offer comfort to our military overseas, as well as provide support to those serving on the home front. The Young Men’s Christian Association, The Young Women’s Christian Association, The National Jewish Welfare Board, National Catholic Community Services, National Travelers Aid Association, and The Salvation Army joined together to become what is now the USO. I had the honor to meet with Ms. Harris. Here’s what she had to say. 1. What is your favorite memory? I have been very blessed. I helped Bob Hope celebrate his 86th birthday in Paris. I am having a cue card Bob Hope used framed. 2. In your opinion, what is the hardest thing for Soldiers? The loneliness and being separated from loved ones. 3. What seems to help Soldiers the most? A friendly smile, genuinely caring and answering their questions. 4. What is the biggest challenge for the future? Staying current, relevant and abreast of their needs. When I first started, I could make someone happy by giving them a phone card and sitting them in a booth. Now, they get to the door, and they are looking for Wi-Fi, they want to be connected. 5. What is your favorite thing the USO does? We keep them connected to family, home and country, which is the USO’s mission statement. 6. What would you change about what you do? I wish we had the resources — both human and financial — to be able to do more for those who do so much for us. 7. How did you get involved with USO? I started as a tour guide, as well as doing orientations in Wiesbaden. 8. Who does USO work closely with beside Red Cross? We work with every organization who supports troops. If we bring coloring books and another organization bring the crayons, the families and troops get what they need. 9. What do you think is hardest for individual USO volunteers/employees? Most people are altruistic, we can’t be all things to all people. That is the hardest thing to help my folks to understand. 10. What is one helpful tip most participants don’t know about the USO? At any USO Center, someone under 18 isn’t allowed without an adult to accompany them. The USO celebrated is Seventy-fifth anniversary in 2016. While the means of serving the military and their families has changed, the dedication and passion on the part of those who work to serve our military is the same.